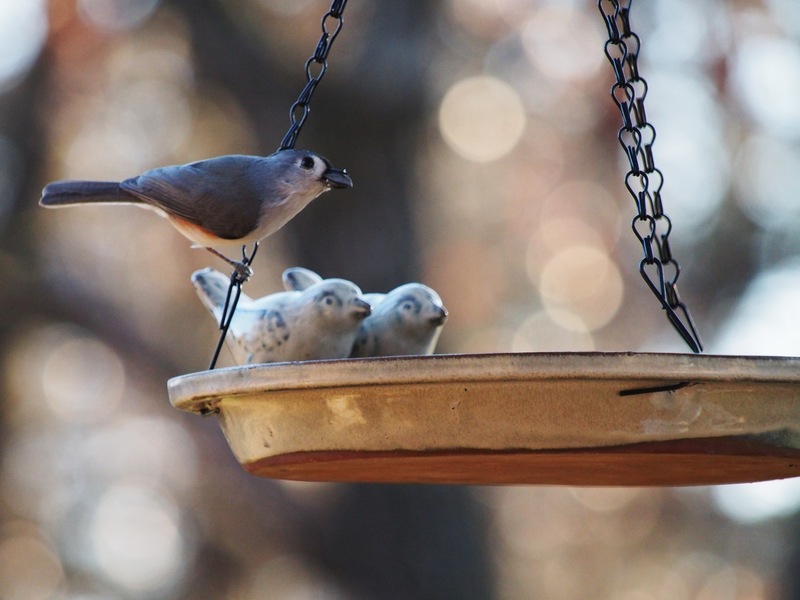 Good morning, my little Chickadees, the Bird Buffet at the Stone House will be open daily throughout the winter, but make sure to stop by for our award winning Sunday Brunch! As always, we welcome cardinals, even if they are thankless snobs who lurk until we close for the night. 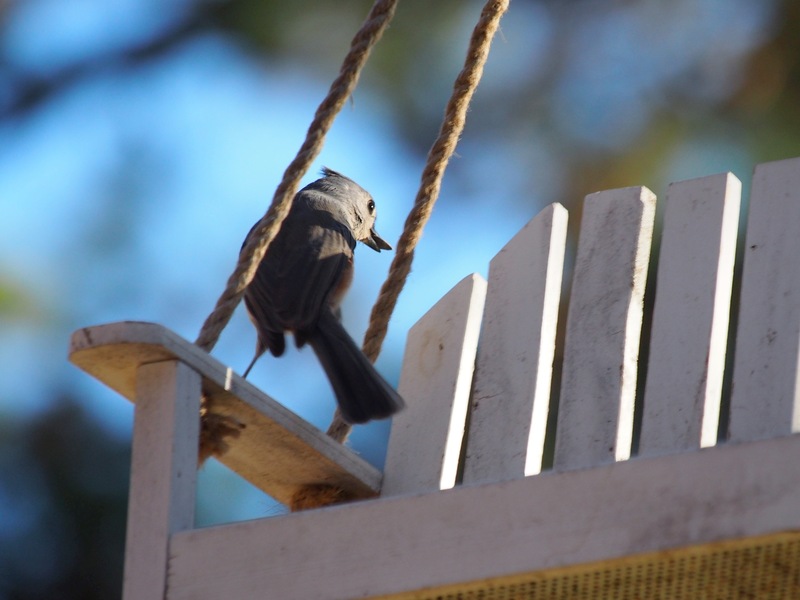 This entry was posted in birds, NaNoWriMo, Ozarks, Photography, wildlife and tagged bird feeding, birds, fall, Olympus, Olympus E-M5, Ozarks, photography, Rat Terrier, Sunday, sunshine, velcro by artsifrtsy. Bookmark the permalink. Thanks – it was so peaceful and sunny here last sunday. Gorgeous photography of gorgeous little birds. I especially enjoy the one of the wee seed-snacker sitting beside two ceramic ones wishing they could have a taste! 😀 Up here in the cold north I happily feed birds but we have a much smaller selection. But I’m happy with every chickadee, nuthatch and sparrow that comes to visit. Great post! I have so many more in the summer, but I’m glad these are sticking around. 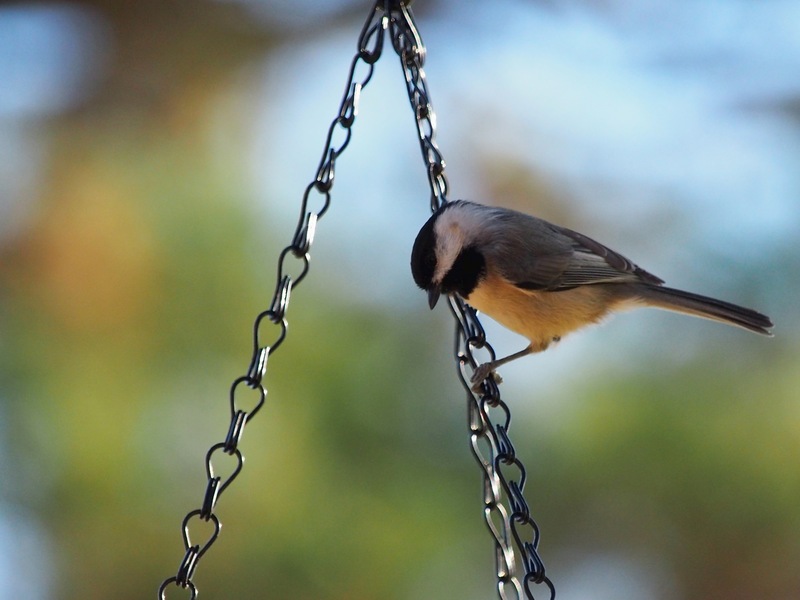 I love chickadees, they are so bossy. 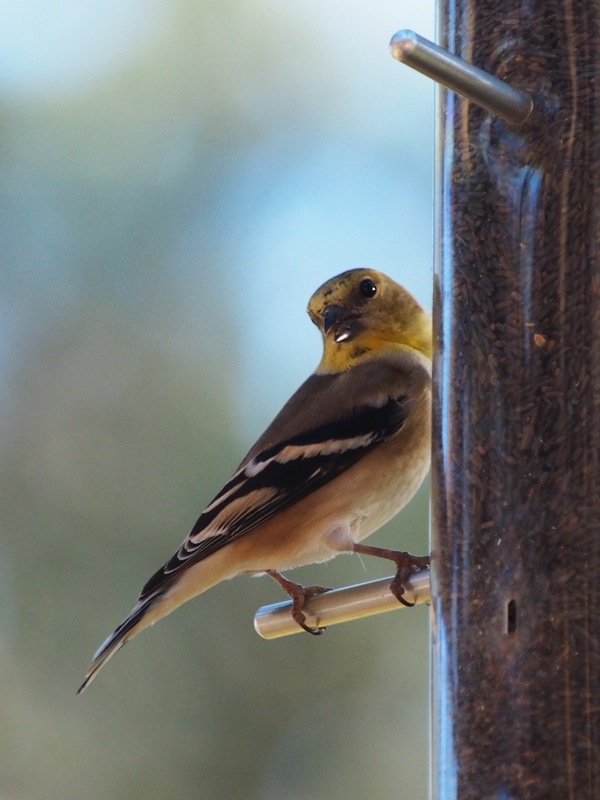 The one in the photo is always squawking at me while I fill the feeders. You and I are the same person, Lorri. We have the same birds at our feeders, didn’t know our names, and now the dog. You have a dog named “Velcro”? We have a brown and white dog we call “Velcro-Dog” this time of year because every leaf he walks near adheres to his fur and then ends up inside the house. Sunday brunch at your house looks like THE place to be! OMG – Elyse! The called me Elsie in high school – freaky! Velcro got her name because she sticks to me. 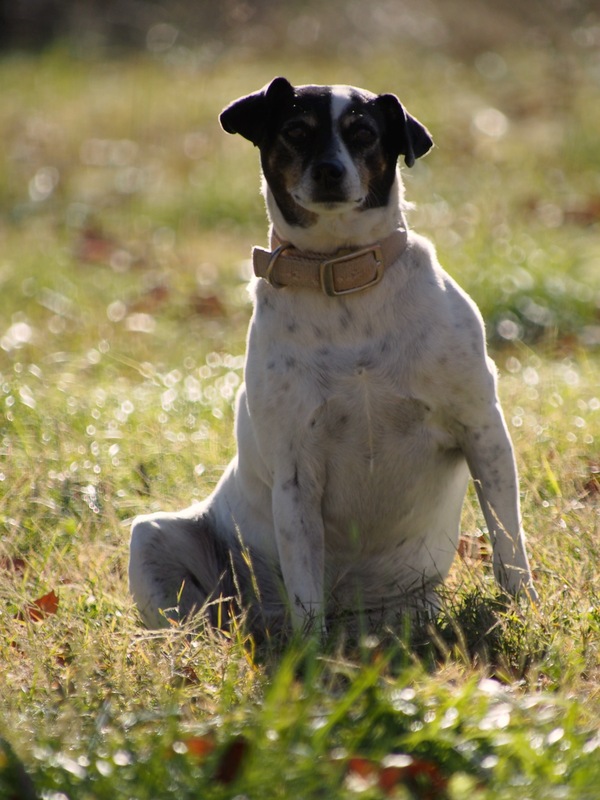 I did a post on her a while back – she’s a 14-year-old rat terrier rescue. I thought I was being original but apparently we are twins separated at birth. I love this kind of post – wow that cardinal is stunning! Thanks Jules – I love them, they are a bit standoffish though. You know the jays keep their distance. What do yours eat? I have 3 kinds of woodpeckers, the downeys were the only ones to show for brunch last weekend. I see cards every morning when I let my pups our and at dusk. They seem to want to avoid the paparazzi. My jays eat sunflower seeds usually. I have the big woodpeckers. Are they the downy ones? last few years I had the male, this year I have a male and female now. Maybe come spring I”ll have little ones. I see cards in the park across the street but they won’t come into the yard. 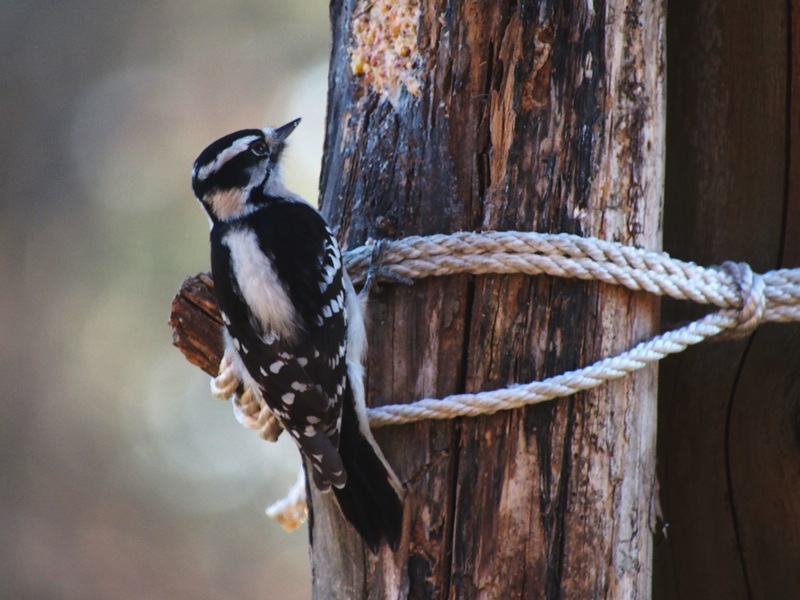 The speckled one right after the nuthatch is the downy. 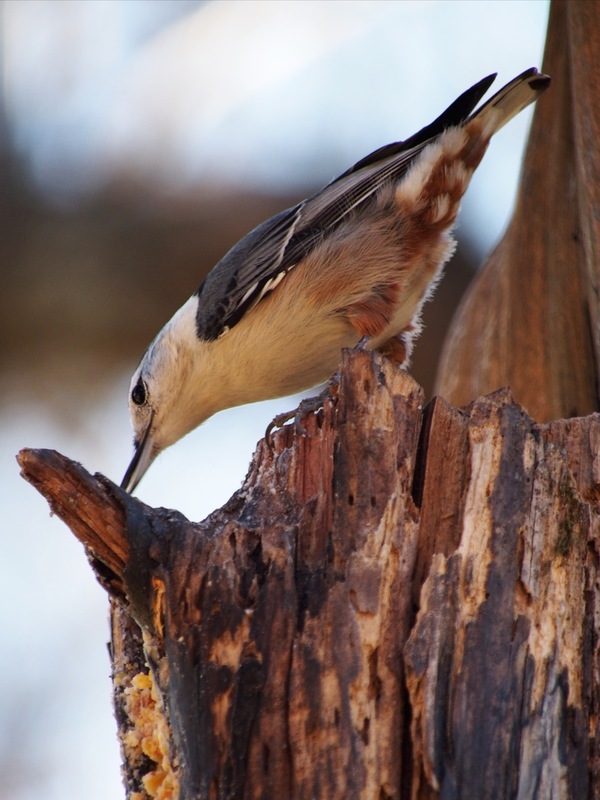 I have red bellied that are a bit bigger than a jay and pileated – they are huge and look like woody woodpecker. I’ve heard that the cards will get closer as it gets colder. Wonderful series of bird shots. I especially like that photo where the sun is reflecting in the Goldfinche’s eye. Love that Cardinal’s colour – but I suppose it would make it show up well in the foliage for any predators. Thanks Vicki, The female cardinal is the color of tree bark so she is pretty well camoflaged. The males are pretty stunning this time of year. I wish I could have gotten him in better light. This goldfinches have no fear of me – they stare me down. Amazing captures – thanks for sharing! OMG they’re Gorgeous, Lorri! 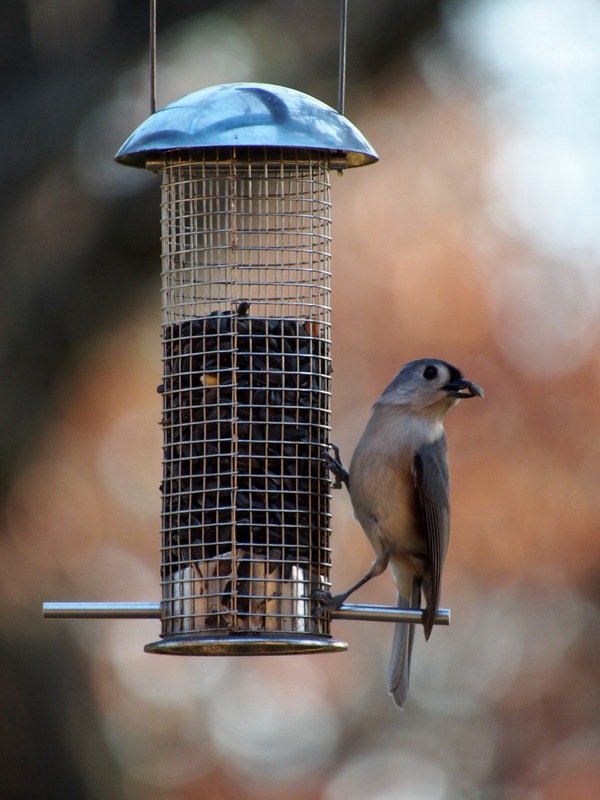 🙂 I’ve never seen a titmice or a nuthatch or a goldfinch or a chickadee before. 🙂 You have such gorgeous birds! The cardinal looks like it’s glowing. I wish they could fly out of your photos and into our garden here! I love your photos so much. So many precious little animal friends in them. I think it’s about time I went and looked at those raccoon photos again and the luna moths. 🙂 My happy places. 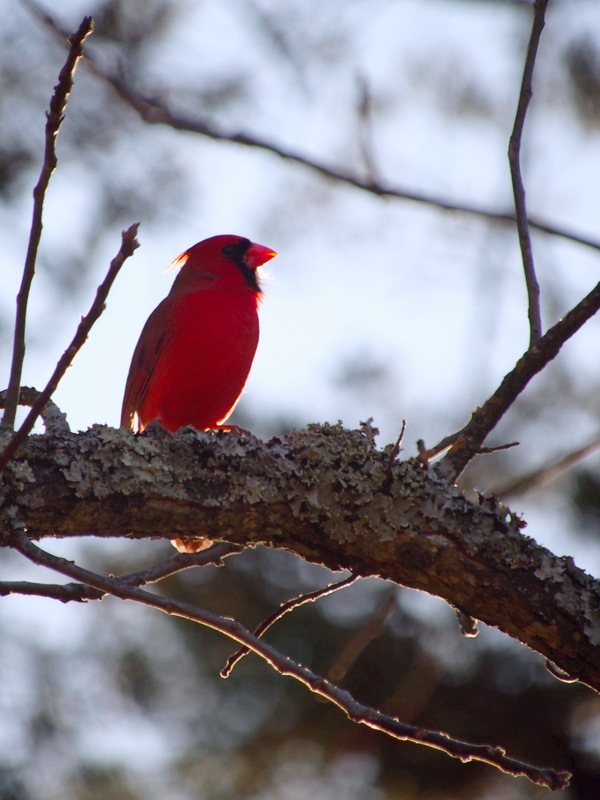 That cardinal was in the sunshine – he was staying away from the feeders because I was on the porch – they are such beautiful birds. Velcro seriously rocks – that pose – it’s like something out of Top Model. I probably just missed it, but I couldn’t find anything on your blog indicating whether you sell any of your work, prices, etc. As you may have read on my blog, I sure could use some help creating album/cover art for my songs. It is a very low-budget endeavor because with all the song-pirating, very, very few people are making any real money song-writing these days. I love songwriting and view it as a hobby–and with all the costs associated with producing a song, a fairly expensive hobby at that–as I’m not a singer or musician either! I say all this to preface a possible opportunity that may intrigue you. Would you like to discuss ways that we can possibly work together to create album covers to give more people the opportunity to see your work and to hear mine? If so, please contact me at russtowne@yahoo.com. You strike me as someone who’d be a real kick to co-create with. Cardinals are “the thankless snobs” aren’t they? Same as here. They are – that guy was just stalking us – we had his table ready, but he won’t sit down with regular folks. Gorgeous, as usual. You capture the beauty of nature so well, Lori. That cardinal is absolutely stunning! Thanks Russ – he eats at the buffet all the time, but never when he thinks I might be watching.